I realized recently that in six and a half years of doing this blog, I have never shown my own collection of Carbo memorabilia. I guess this is because, as my friend Diane Lau once said, even though many people collect, it seems neurotic and I have visions of Guy visiting my house and fleeing in horror. I have collected Carbo memorabilia for ten years now and have amassed a pretty extensive collection. It's gotten to the point that there isn't much that I haven't seen or don't already own, and though the really unique pieces on sports memorabilia auction sites are often too rich for my blood, I have been lucky enough to acquire some rare items. 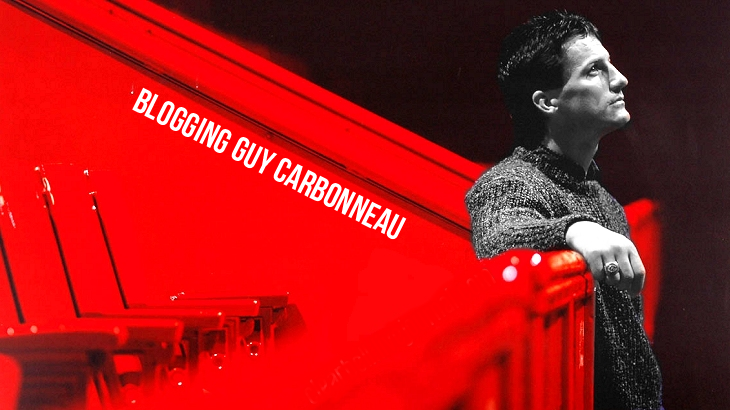 So without further ado, here is The Only Carbonneau Museum in the Ottawa Valley. The door to my computer room is covered by this HUGE Carbo growth chart poster. It was a mail-in promotion from Kraft Foods back in 1989. I happen to love this poster because it includes two things I love, Carbo and teddy bears! The photomatches. The jersey was actually pretty easy to match up to photos; there is a black thread in the T in "Stars" that you can see in these photos. And these are the photos hanging to the left of the jersey. The one on the bottom, a signed action shot of Guy from the 1999-2000 season (his last in the NHL) is actually the first piece of autographed Carbo memorabilia I ever got. On the shelf above the jersey are photos from both times I met Guy, along with a few random pieces of memorabilia. A closer look at the memorabilia items. The little Carbo figurine was a promotion from Provigo (a supermarket chain in Quebec) during the 1988-89 season. Both the Coke and the Dallas Stars slice of the ice (actual ice water from Guy's 3rd Cup) were gifts from readers of this blog. And the signed business card is from Guy's stint as Habs head coach. And this is the photomatch to the Sher-Wood stick (the third one on the wall). The stick is from Guy's second-to-last game before he retired. This is a signed candid photo of Guy from the 1993 Habs Cup parade. You can barely see the signature; Guy's pen died. This is a rare signed photo of Guy. It is from when he played for what was the Habs' AHL affiliate at the time, the Nova Scotia Voyageurs. (Guy played for them from 1980 to 1982.) My Steiff turtle also wants to say hello. Moving around the room again, here is the photo that Carbo signed for me and my fiance Erik for our anniversary in 2009. Erik wrote to Guy requesting an autograph. The photo directly below it is of another retired NHLer, goaltender Pascal Leclaire. This is my Kraft Drawings print of Guy. This was another promotion from Kraft Foods, this time in 1987. Kraft issued a series of hockey cards with drawings of players and you could send in proofs of purchase and receive large posters of the artwork. This was a hard one for me to acquire on eBay and I haven't seen another one up for auction since. A graphic artist friend made this image for me back in 2008. It is a composite of several of my favorite photos of Guy. The quote is from Roch Carrier's "The Hockey Sweater." And last but certainly not least are my Carbo rookie skates. These are photomatched as well, to Guy's 1982-83 Steinberg rookie card. Also Mickey Mouse ears. The placement of things in my room tends to be random. So that's the tour! Hope you enjoyed it! 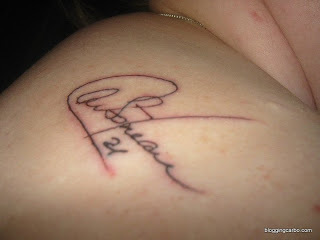 You can't tell me that Guy doesn't have one of the most beautiful signatures in hockey. I have many pieces of autographed Carbo memorabilia and I have long joked that if the Pawn Stars ever needed an expert to authenticate a Carbonneau signature, I'm their girl. I can tell a real one from a fake a mile away. 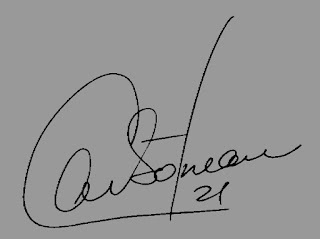 Guy has signed his name thousands of times over the course of his career and it's interesting to see how his autograph has evolved over the years, so I thought I'd write a post on this interesting subject. From my collection, this is a photo of a very young Guy with the Nova Scotia Voyageurs (AHL), Montreal's farm team which Guy played for from 1980-82. At this time Guy was still signing his full name but you can see the pattern of his signature starting to develop. 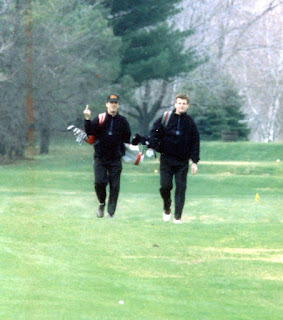 The exaggerated "C" in Carbonneau for example. There is no "21" next to his name like you will see in later signatures, but this is to be expected as Guy wore the number 10 with Nova Scotia. These autographs were signed in 1984 and 1985 respectively. Guy still signs with his first initial but here are the beginnings of what I think is the most unique part of his autograph: the "CH" formed in the center, for Montreal Canadiens. 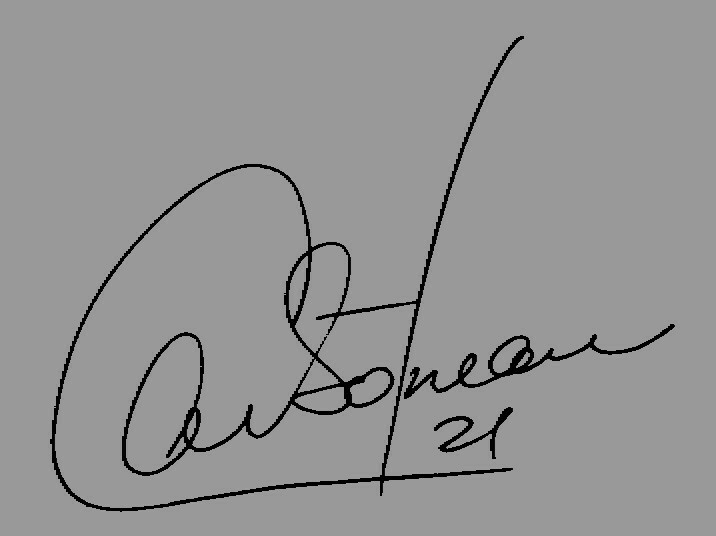 Even after being traded, Guy included this as part of his signature and continues to sign like this to this day, and I think it shows his pride at being a member of such a storied franchise. There you have it! And for what it's worth, if I had the chance to ask Guy any question I wanted I'd ask him what the strangest/most bizarre thing is that he's ever been asked to sign. 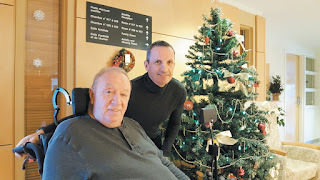 Something that grabbed my attention while perusing Twitter recently: over the holidays, Guy visited his former coach Jacques Demers in the hospital. Demers, who suffered a stroke in April 2016, is paralyzed on the right side of his body and can only manage to speak a few words. He is currently in a rehabilitation facility offering long-term care. 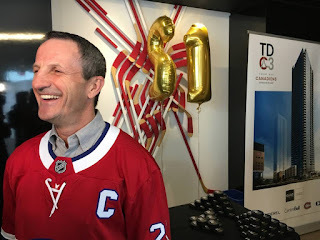 He was delighted by Guy's visit, especially when Guy told him that there will be a meeting of the members of the 1993 Stanley Cup team this coming April to celebrate the 25th anniversary of the Cup win.